New York is a fabulous place to visit or to live. The city is virtually overflowing with things to do and see and it's easy to get caught up in the magic. It can also be easy to get a little lost in the hustle and bustle of constant activity. Sometimes you just need a quiet spot to take a break from all the excitement that surrounds you. At the Harbor House we'd like to offer you that spot- an alternative to the crowds, noise and high price's of Manhattan hotels. Built circa. 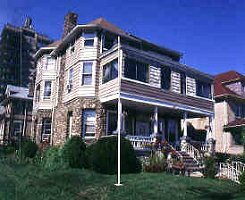 1890 on the New York harbor at Penny Beach, Staten Island; the Harbor House Bed and Breakfast provides the best of both worlds. Harbor House is convenient to all major airports and is only a half an hour from the heart of Downtown Manhattan by car or by public transit. Yet despite the close proximity to all the marvels of the city that never sleeps, we are pleased to retain a quiet, relaxing atmosphere of escape where you can enjoy the special kind of laid-back easy living that is inspired in this unspoiled piece of country within the city. From its vantage site, the Harbor House commands an unobstructed view of one of the most beautiful skylines in America. The sweeping panorama includes Manhattan with the World Trade Center and the Chrysler Building, the New York Harbor, The Statue of Liberty, Brooklyn, and the majesty of the Atlantic Ocean. Relax in ocean breezes as you enjoy the harmony of the sea, the bustle of the harbor, and the incredible Manhattan skyline, all framed by extra large picture windows. Travelers checks, MC / VISA / Discover, money orders, and cash accepted. This and other Staten Island Bed and Breakfast Inns can be found here in The Register.